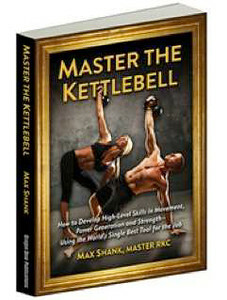 Max Shank's 'Master The Kettlebell'. This book is a must-have for current or aspiring RKC or HKC instructors, or anyone who needs real, practical, and POWERFUL advice for kettlebell use. The exercise descriptions, mobility information, and solid program design strategies are incredibly worthwhile. My advanced clients will love having a resource to reference when practicing new intermediate/advanced moves at home too. A great all around approach and one that I will be very proud to regularly reference and share.